Last week, I went back to the 9th floor. It’s already been four months since the final dose of poisons, so it was time to revisit the dreaded oncology waiting room and freeze in over-air-conditioned spaces with the hatted people. The 9th floor has its own ersatz candy stripers: Cancer Veterans that peddle free ginger ales and wrapped sandwiches, all the while sending positive messages like, “hey look at me all alive and chipper with my ONE ear!” They are a lovely bunch of scarred people who voluntarily return to the very place that frightened, disfigured, and ultimately cured them. They are brave. For me, the sights and smells of the 9th floor threw me into a shaky panic, and a desire to bolt all the way back to 2011 when none of this would ever happen to me. But because follow up appointments are necessary for, I guess, the rest of time, I stuck around to be pricked and weighed and measured. If Bernie wasn’t around for reference, I’m certain my doctor would never recognize me. When I met Nadine, it was with long hair and a rather constant urge to cry or vomit. By our second meeting I had chopped off my blonde locks in anticipation of the inevitable, and I attended all subsequent appointments in a different hat and multi-layered-ooh-isn’t-she-artsy outfit. So when I sidled up to Nadine on Friday, she couldn’t place me until my handsome Asian companion put me into context. Now, I have freckles and cute hair and (ahem) a bounce in my step. I was wearing a sundress that doubled as a walking reference for the talent of my plastic surgeon. I was doing my best impression of The Girl That Doesn’t Belong Here. Sadly, wardrobe optimism didn’t come through for me this time. I do belong on the wretched 9th floor with the one-eared sandwich guy; and I’ll need to keep returning at regular intervals for weights and measures, and to fool Nadine with another few inches of unfamiliar hair. Follow up is now my part-time, crappy job. Surgery, poison, and tamoxifen have boosted my disease-free survival probability to 94%. But as the Tiger Mom taught us, 94% is hardly a concerted effort from someone with Ivy League aspirations for survival. The latest data indicate that staying starlet skinny and culling my consumption of cava could possibly improve on that number. This is all sorts of unfair. Everyone would agree that I deserve cheese-covered meals washed down with champagne. And ice cream. Every night. My old friend and Cancer guru, Lisa, had already warned me about the damning data (although she still maintains that her husband slipped the oncologist a fifty to scare her into her skinny jeans). Lisa was my best friend in high school. We were so close that boys would send Valentine’s Day cards addressed to the two of us. We were goofy and fearless, free-spirited, and occasionally quite naughty. We took classes together, got our first jobs together slinging fro-yo and pilfering the toppings, and still spent countless hours on the phone to review anything that happened when we were apart. But when Lisa married her college sweetheart, immediately starting a family, I was off to medical school to sleep on a futon and split the cable bill. While she was breast-feeding, I was dissecting cadavers: our lives were too different for our old, daily rehashing. For years, our catch-ups were spotty, but there was always that connection from having shared those fun and brutal teenage years together. After Facebook was invented, re-connecting all of us for good or evil, I was able to find Lisa again. In our years apart she had battled her own breast cancer with a bilateral mastectomy and chemotherapy. 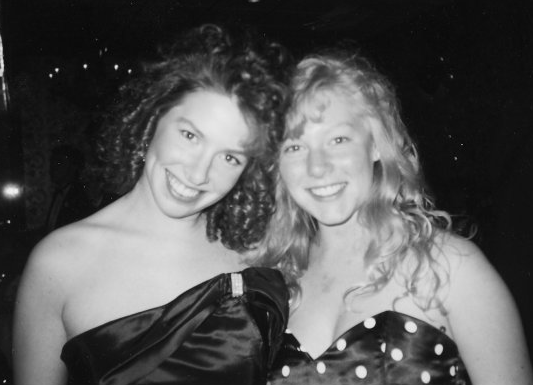 Like the teenage, inseparable twins we once were, our diagnoses were nearly identical: invasive, unilateral breast cancer, negative nodes, and clean scans. Lisa’s emails and care packages to me were survival itself (and reminded me of countless notes we had passed in class). I had always admired Lisa’s spirit, her Faith, her overflowing love for the lucky people in her life. Her approach to breast cancer was so honest and positive; I couldn’t help but be encouraged that I could get past it, too. Plus, she sent all of those little knit caps, chocolates, thank you notes, and soft socks I never knew would be absolutely vital. I haven’t been sleeping well since my visit to the 9th floor last week. I’m overwhelmed by the fuzzy memories of really horrifying things that, though over, happened nonetheless. I will look to my guides (Lisa, Kelli, Katie, and you lovely ladies who share Maria with me) to reassure me that these trips get easier, that each one won’t inspire another two-page blog of bad memories and self-flagellation. And though I will more frequently be the green-tea-and-salad girl, I’ll still indulge when the occasion calls for it. Sometimes fudge and Prosecco are really really necessary. There’s just no damn data to prove it.